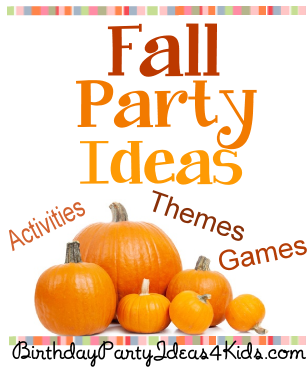 Fall Party Ideas, party themes, party games and activities for kids, tweens and teen parties. Our favorite Fall / Autumn theme party ideas that will make a Fall party easy and cheap to plan! Games and activities for ages 1, 2, 3, 4, 5, 6, 7, 8, 9, 10, 11, 12, 13, 14, 15, 16, 17 years old. Cheap and easy carnival style games for kids of all ages! Unique Fall party games and activities for kids, tweens and teens. Over 50 fun and unique Thanksgiving and Fall themed clues for Charades for kids, tweens, teenagers and adults! Great for family parties, birthday parties and classroom parties. Free printable list! Players draw clues for their teammates. Over 50 fun and free clues to print out! Fun Scavenger hunt with 30 Fall / Autumn themed items to find! Nature Scavenger Hunt with nature items to find!